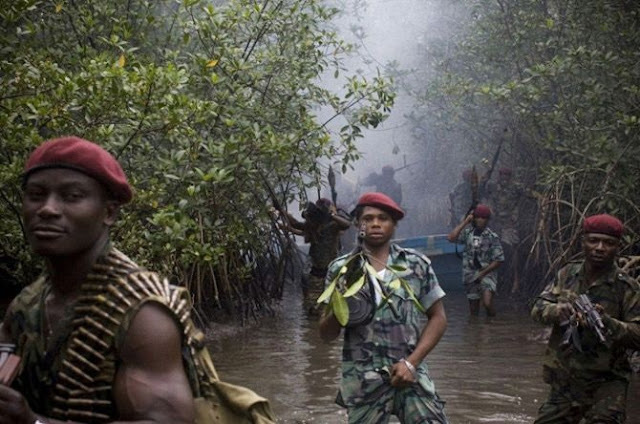 WARRI—Pan Niger Delta Forum, PANDEF, led by a former Federal Commissioner for Information, Senator Edwin Clark, is in talks with the Niger Delta Avengers, NDA, to avert the plan by the militant group to resume bombing of oil facilities in the region. Government has also opened discussions with PANDEF through the Minister of Niger Delta Affairs, Pastor Usani Uguru Usani and Special Adviser to the President on Niger Delta, Brigadier-General Paul Boroh (retd.). While Pastor Usani met with Chief Clark in Abuja on Tuesday, Boroh, who is also the Chairman of the Presidential Amnesty Programme, PAP, parleyed with him, during the week, on the way forward. Meanwhile, former agitators under the third phase of the Presidential Amnesty Programme rose from a crucial meeting, yesterday, in Bayelsa state demanding direct payment of the 13 per cent derivation funds to oil and gas bearing communities, failing which they would join forces with NDA to wreak more havoc on national oil installations. The ex-agitators also urged the Federal Government to revoke within 21 days, all oil blocs unequally allocated to northerners. Similarly, the Pere of Gbaramatu Kingdom, Warri South-West Local Government Area, Delta State and the Gbaramatu Council of Chiefs, have placed villagers in the kingdom on red alert to report any person or persons found close to any oil/gas pipeline in the kingdom. Clark confirms talks Contacted, yesterday, Chief Clark told Vanguard: “We are in contact with the Niger Delta Avengers to give peace more chance and to maintain the ceasefire, despite their calling off the ceasefire and announcing that they would resume hostilities shortly. “We sent emissaries to talk with them and we told them that it is better to maintain the ceasefire and that it is what everybody, including PANDEF wants. “It is because of all these that we are also going to meet in Warri, Delta State, next week, to fast-track the peace process. We are going to discuss all that, our meeting with them and federal government officials at our emergency meeting.” Asked the response of the Avengers to PANDEF’s plea, he said the emissaries were yet to get back to him. On the visit of PAP Chairman, he said, “Two days ago (Monday) General Boroh was here. He came on behalf of the Federal Government to discuss some of the issues raised by the boys and the way forward. “The Minister of Niger Delta, Pastor Usani came yesterday (Tuesday). Other PANDEF members were here on the same matter. The country belongs to all of us, we are all appealing to the NDA not to bomb oil facilities in our region. “Pastor Usani assured that government has not abandoned our 16-point demand, on our part, we stand on the 16-point programme that we submitted to government, which we believe are implementable,” he said. 2-week pause Finding by Vanguard indicated that following the private intervention of PANDEF, the Avengers may have, unannounced, given the federal government a two-week moratorium to come clean on the demands of the region before restarting their “Operation Red Economy.” Our source said, “The PANDEF extra-ordinary meeting is to look that the whole issues comprehensively, further appeal to the militants not to call off the ceasefire and call on the federal government to take urgent steps to constitute its Dialogue Team as requested by the region, November 1, last year.” Joining forces with Avengers Spokesperson for the third phase ex-agitators, self-styled “Gen.” Ebiowei Perekebena, alias General Hot Water, said they had followed very closely the happenings in the country, especially the lopsided appointments carried out by the federal government to the detriment of the people of the Niger Delta, whose resources they have used continuously to oil the economic machine of the Nigeria state. The meeting started midnight Tuesday and ran to the early hours of Wednesday with former field commanders and unit commanders from Ondo, Edo, Delta, Bayelsa, Rivers, Cross-Rivers and Akwa-Ibom states in attendance. They resolved that in the face of the current situation, “Only the urgent payment of 13 per cent derivation funds directly to the oil and gas bearing communities remain the only option to calm frayed nerves.” Gbaramatu kingdom raises fresh alarm Also yesterday, spokesperson of Gbaramatu Kingdom, Chief Godspower Gbenekama, raised the alarm that soldiers’ foray to Oporoza and other parts of the kingdom, Tuesday, was to take coordinates for a premeditated invasion. “Intelligence information at my disposal has it that what actually transpired yesterday (Tuesday) was that the military came to take strike position coordinates for a planned invasion of Gbaramatu kingdom. “But we are still of the opinion that the military should not use Gbaramatu as their battle ground and they should rather allow peace to reign. “At the same time, all the Gbaramatu community chairmen and myself met today (yesterday), where the Pere of Gbaramatu and the Gbaramatu Traditional Council of Chiefs directed that all community chairmen and youths from the kingdom should be on red alert because criminal elements might use the present threat by Avengers to cause havoc in the area,” he said. . “We agreed that if any villager sees anyone getting close to any government facilities or pipeline in the area, such person(s) should be apprehended and handed over to the security agents within or around the area,” the spokesperson added. Residents flee as gunboats, fighter jet parade Benneth Island There was confusion, yesterday, at Benneth Island, Ogbe-Ijoh, Warri South-West Local Government Area, Delta State, as residents scampered into surrounding forests at the sight of a fighter jet and gunboats. A villager said: “Today, a fighter jet and 12 gunboats were deployed in Benneth Island to intimidate us. We do not know what we have done to warrant the siege. “There was bedlam because we did not know if they came to kill us. Everybody, young and old, ran into the bush to hide,” he said. Ijaw Youth Council, IYC, led by Mr Eric Omare, in reaction to the development, called for restraint on the part of the armed forces, saying that innocent citizens should not be intimidated by security agents who are supposed to protect them.